Britney Spears former manager Sam Lufti escorted out of her show in Las Vegas. Just when you thought this poop stain had disappeared once and for all, Sam Lutfi has reappeared. This time in Las Vegas, where Britney Spears was kicking off the third leg of ‘Piece of Me,’ her residency in sin city. 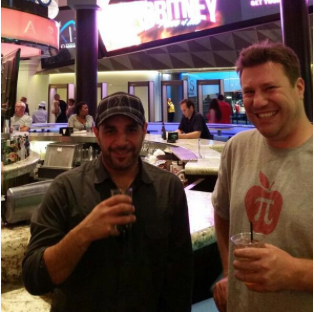 Lutfi tweeted a photo of himself standing in front of a sign for Britney’s show. At first, fans of the pop star thought he was trolling and it was all a big set-up, but nope. Lutfi was indeed in Vegas, and indeed stepped foot inside The Axis. However, rest assured Britney Army! He didn’t get anywhere near Britney. In fact, he only got to see about 5 minutes of the show before being quietly escorted off the premises by security – and without incident.